Brussels: The European Commission wants European Union (EU) governments to jointly combat the growing economic slowdown with a €200 billion ($256.22 billion, or Rs13 trillion) stimulus plan to boost growth and confidence among consumers and businesses. In a two-year European economic recovery plan, made public on Wednesday, it calls on the 27 EU governments to spend more to halt the accelerating economic slowdown that has pushed some European nations into recession. 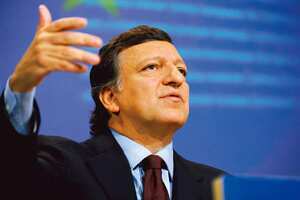 “Exceptional times call for exceptional measures," said European Commission president Jose Manuel Barroso. “The jobs and well-being of our citizens are at stake. Europe needs to extend to the real economy its unprecedented coordination over financial markets," he said in a statement. “This recovery plan is big and bold, yet strategic and sustainable." He said that just as in recent weeks when EU governments acted jointly to shore up credit and restore some market confidence, they should act together again on fiscal measures. The economic stimulus report comes a day after the Paris-based Organization for Economic Cooperation and Development (OECD) said the financial crisis will likely push the world’s developed countries into their worst recession since the early 1980s. The Paris-based OECD said economic output will likely shrink by 0.4% in 2009 for the 30 market democracies that make up its membership, against the 1.4% growth prediction for 2008. The European Commission echoed the OECD conclusion that now is the time for significant fiscal rescue measures— including tax cuts—provided they were timely, targeted, temporary and coordinated. On 14 November, the zone of 15 EU nations that share the euro as their currency officially entered a recession, recording a 0.2% drop in economic output for two successive quarters. While the need for drastic measures has not escaped EU governments, significant differences between them have emerged in recent days. On Monday, German Chancellor Angela Merkel and French President Nicolas Sarkozy rejected a coordinated cut in value-added taxes (VAT) as Britain announced it was cutting its own to 15% from 17.5%. British chancellor of the exchequer Alistair Darling also announced tax increases for the wealthiest Britons. In Paris, Merkel and Sarkozy suggested that while lowering VAT might be “the answer for some countries" they would not opt for losing government revenue that way. Merkel said she was gauging the effect of a recently announced €32 billion German economic rescue plan before deciding on new steps. • A rise of €15 billion in regional economic lending by the European Investment Bank is bound to attract private financing. • The EU will be “flexible" in judging public spending. It now limits budget deficits in euro zone nations to 3% of GDP. That ceiling stays but the European Commission will impose less strict deadlines for governments to return to fall back into line. The euro zone’s sound finances rules “will be applied judiciously", the report said. • Governments must consider extending jobless benefits, cutting VAT and labor taxes and provide guarantees for loan subsidies to offset higher risk premiums. • Economic reforms must be enacted across the EU to make European economies more competitive through retraining programmes, slashing red tape and financial aid for research and development projects. • Europe “needs to accelerate" the shift to greener economies and step up investments in non-polluting sectors and technologies and invest seriously in better energy distribution networks. The report said the financial crisis and subsequent credit squeeze must not scare Europe away from pushing ahead with ambitious climate change targets. Apart from creating a cleaner environment, it said, measures such as slashing greenhouse gas emissions and promoting clean and renewable energy offer “new economic opportunities...and create jobs."